Announcement Gold Bar Necklaces, Personalized Necklaces, Layered Necklace Sets, Long Necklaces, & the BEST Layering Necklaces. Personalized and custom layering 14K gold-plated/ sterling silver jewelry. 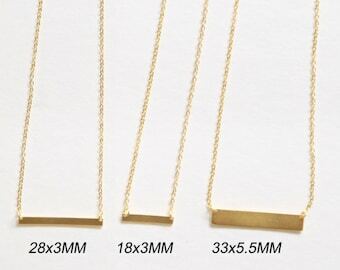 Gold Filled Bar Necklaces, Personalized Necklaces, Layered Necklace Sets, Dainty Necklaces, Long Necklaces, and Layering Necklaces. Be sure to follow us for updates and pictures! Share with us also your looks! Free Domestic Shipping for all orders no code needed. Gold Bar Necklaces, Personalized Necklaces, Layered Necklace Sets, Long Necklaces, & the BEST Layering Necklaces. Beautiful, delicate necklace! Love it! Why choose one when you can layer 3? Brielle Designs was born out of love and is maintained by our passion to design and create beautiful jewelry. We take pride in our work and when you order from Brielle Designs you are getting the highest quality jewelry from owners who love delivering a beautiful product. At Brielle Designs we create SIMPLE layering necklaces. We provide delicate jewelry and necklace layers that allow you to mix and match and create your own masterpiece. Our pieces can be worn in layered sets or by themselves. I am a young professional living in Portland Oregon that wanted to pursue my passion for designing and producing layered jewelry. I got into the business of making jewelry due to the struggles I found when searching for simple, dainty and versatile necklaces for myself. Brielle Designs started as a hobby but is now a running and growing business with more designs constantly in the works. I am truly passionate about the business and you will see that in the detail and care put into every item sold on this shop. Without YOU we wouldn't be here.. I am a 25 year old living in Portland Oregon, with a degree in Marketing and Supply Chain from Arizona State University. I have a passion for creating and designing beautiful jewelry that is simple and versatile. We accept unworn returns and/or exchanges within 7 days of your packages arrival. Please contact us before trying to return your product. Etsy handles all payment transactions. We will never see your payment information or billing address. We want you to receive your order as soon as possible and strive to make that happen. Your item will ship 1-2 business days after placing your order. To check the status of your order or to track it once it has been shipped please visit your "purchases" section when logged into your Etsy account. There you will find your order with us and a link to track your packages. Need to upgrade your shipping? If you need your order rushed, please make sure to select an expedited form of shipping. Also, please note the date you need it by (in the "notes to seller" section) so we can get as close to the requested date as possible. Please note: Brielle Designs ships worldwide and international shipments transit times vary.